Bnei Akiva bencher/grace after meals/zmirot booklet for your family celebration with a full color cover design. 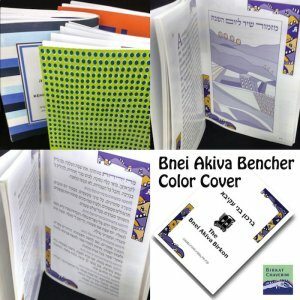 Design the cover of your Bnei Akiva birkon or bencher in full color or use one of ours. Color designs can completely cover the full area of the cover. 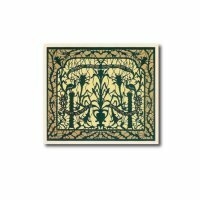 In addition, full color allows you to use photographs or other multi-color illustrations. Please refer to our submission guidelines. Please note that full cover designs may not print exactly as they look on your screen. To ensure an exact color match, please order a print proof. Please leave four to six weeks for shipping and customization from the time of proof approval. A one time fee of $40 will be applied for setup costs. The bencher project is a fundraising project for Bnei Akiva of North America and Canada. 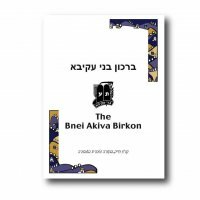 Money from each sale goes towards Bnei Akiva glilim in North America. To make sure that donations from the sale reach your local Bnei Akiva galil/region, please select from the drop down list.